Some basic advice on how to feed the birds in your garden and attract the greatest diversity possible. In winter many of us put out food and water for garden birds not only to help them through the hardest time of the year but also because they are such a pleasure to see. Living near the river as I do, I put out food all year round and enjoy a wide variety of visitors – but many people I have spoken to about my passion say that either they don’t see very many birds, or the food they put out sits there untouched for weeks on end until they finally throw it away. What a shame this is. Now, certainly, there is a chance this is simply a result of there not being very many hungry birds around – perhaps a neighbour feeds the birds regularly or there has been a bumper crop of seeds and fruits in the Autumn. However, it is likely to be for other reasons. The first of these is that the garden bird feeders may have been sited in the wrong place. Birds like to feel safe when feeding and so while very hungry birds will get used to a feeder almost anywhere, the more wary species – or those less hungry – may stay away from your feeders simply because they don’t feel safe there. It is normal to place feeders out in the open so you can clearly see the birds that visit, but bear in mind that this is exactly what makes garden birds feel insecure. A better location for your feeders is an area where there is some degree of cover. Placing feeders in or near trees, bushes and hedges seems to work best and attracts the greatest number of winter visitors. However, there is another element in play here – and that is the actual food you are putting out. You see, different birds like to eat different foods – just as they would in nature. Some eat seeds, others insects, some fruit and so on. Certainly there is generally some overlap in wild birds, but if you aren’t putting out a full range of goodies then it is unlikely you are attracting all the birds that you could. When I have mentioned this to people in the past, and they have resited their feeders then added a range of foodstuffs, they normally report back within a few weeks that they are seeing considerably more birds in their garden. But what foods should you put out? Well, try peanuts, seed and fat balls for a start. These seem like the three main staples of the wild bird food trade and should attract far more birds than if you only had one of them out. You will likely find your local birds have a specific favourite. For example, in my garden they eat the fat balls as quickly as I put them out while hardly touching the seed. But you can also add all sorts of extras. For example, a bowl of mealworms is usually popular, as are scraps from the table. Try things like mild grated cheese, cooked unsalted rice, uncooked porridge oats and fruit and I think you will notice the difference in a very short space of time. Even better, it means less waste from your table to get rid of – and your garden will be full of stunning birds right throughout the coldest months of the year. 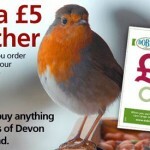 Richard offers more advice on wild birds at his site All Garden Bird Feeders.